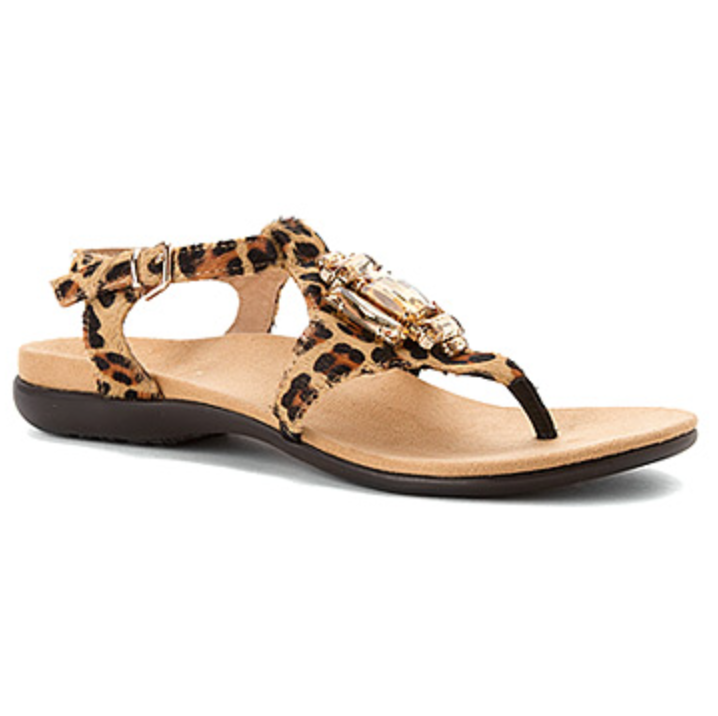 Have a fling with bling when you wear the Vionic with Orthaheel Technology Leopard print thong sandal. Made from suede or animal-print pony hair and lined in soft suede, this women’s ankle-strap sandal features faceted stone accents for a touch of fashion flair. A suede footbed manages moisture atop the dual-density cork-and-rubber midsole, which includes an EVA pad for added shock absorption. Podiatrist designed and recommended by Dr. Andrew Weil, the biomechanical orthotic footbed features arch support and a deep heel cup to comfort every step. The 1st Ray Flexor Zone™ supports the big toe; Tri-Planar Motion Control reduces pronation, restoring the foot to its natural position for proper alignment. A shock-absorbing, logo-print EVA sole to carries you securely, mile after mile. Fit tip: This style is available in whole sizes only. If you wear a half size, we recommend ordering down: For example, if you normally wear an 8.5, order a size 8.